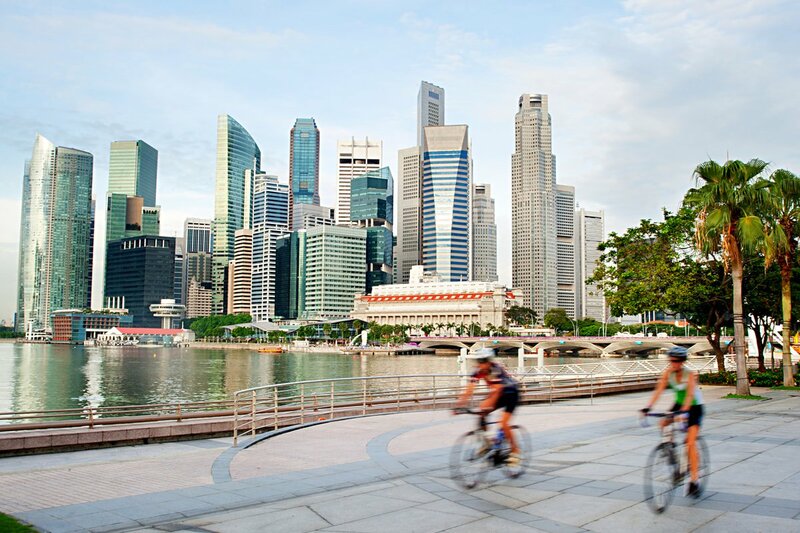 On this road cycling odyssey, we journey from Thailand's scenic south to charming Malaysia and then cross the border to Singapore, a booming city-state rich in both natural and urban splendours. Cycle through a series of charming towns and explore Malaysia's interesting mix of cultures through its delicious cuisine, which draws its influences from China and India, explore a plethora of temples and markets, and learn Malaysia’s history and Colonial past through the colonial-era architecture in many of the older buildings. We start by riding along the Andaman Coast of Thailand on mostly flat terrain through thick mangrove forests and plantations and explore along the way the Kra Peninsula with its unique mixture of Thai and Malay culture. After a dip in a local hot spring, we take on country back roads and discover stunning nature, colourful mosques, and rural villages. After a relaxing night at a peaceful beach resort, we continue exploring indispensable parts of the country's history in the historical city of Malacca where we visit the town's many significant ruins and buildings, including a UNESCO World Heritage Site dating back to 1440 when the state was first founded, and get the chance to see Malaysia in a new perspective before crossing the border to dynamic Singapore for more action. There are no scheduled departures for this trip. But please send us an inquiry telling us when you'd like to go, how many people are in your group, and we'll get back to you shortly. We meet at the hotel for a trip briefing and a seafood dinner. We start the day by riding through the mangroves and rubber plantations to avoid traffic. We continue cycling southwards, along the Andaman coast, directly to our hotel. We cycle on a scenic road alongside the sea before heading inland, where a soak in a hot spring is optional. Next, we cycle through thick mangrove forests and rubber and palm plantations before we cross to our overnight island resort on Sukorn Island. Head back inland and cycle scenic back roads and see rural Thailand at its best before riding south to the border city of Satun. Cycle across the border to Malaysia. We tackle a moderately challenging uphill ride followed by a thrilling downhill and overnight in Alor Setar. Today's ride is mostly flat as we hug the scenic coast all the way to Tupah Recreational Forest, where we go for a refreshing dip in the river. We cross to the island of Penang and overnight at the colonial town of Georgetown. Tonight, we hit the town and discover the town’s famous delicacies. The day is off from riding to explore the streets to find the charm of Penang's cultural centre and UNESCO World Heritage Site, Georgetown! Leave Penang with a short transfer before taking the old Hwy 1 all the way to Taiping, then ride into the city. The afternoon starts with a short ride but steep uphill as we cycle on the edge of the popular mountain climbing destination of Gunung Bubu. Spend the rest of the day exploring Ipoh! A nice and easy start as we ride to Gua Tempurung, one of the longest caves in Peninsular Malaysia. The remainder of today's ride goes on undulating ways through plantations, fields, and villages. We aim to finish the ride in the morning to spend our evening in Kuala Lumpur. Cycling brings us through palm plantations with some undulations on the quiet roads. After lunch, we transfer into the heart of KL and have an evening sunset walk around the Petronas Towers. Free day to rest or explore Kuala Lumpur, or we can help to arrange a half-day walking tour. We take on a few rolling hills today as we make our way to Malacca, a historical city and a UNESCO World Heritage Site boasting numerous historical ruins and buildings. Go for a stroll down Jonker Street in Chinatown for a one-of-a-kind shopping experience and sample some of Malacca's tasty treats! We leave Malacca and ride to the charming Batu Pahat. Visit the seaside village of Minyak Beku, sample locally grown tea or coffee at an old school "warung" (coffee house in Malay), or stop by the local market and sink your teeth in some local delicacies. Bid farewell to Malaysia and cycle down to the border for Singapore. We spend morning discovery of the heritage of the world's aspiring 'City in a Garden', visiting modern museums and whimsical gardens, many of which are conveniently connected by scenic bicycle routes. We can help arranging a transfer to the airport in the afternoon for your onward plan. Day 2 - Krabi - Pak Meng Ride 114km. +727m. I love Asia, its people, its food, and the climate. Cycling is a great way to appreciate them. Guides, drivers all worked hard to ensure a good rider experience. The terrain was fairly flat with only a handful of climbs. The days off in KL & Penang provided a good contrast to the riding days. Another really good trip, great cycling, lovely mix of riders, great guides and so much food! There are no scheduled departures for this trip at the moment. Please contact us to arrange a private departure. You will cycle a total of 1,101 km on paved roads along the Andaman Coast and beaches, through mangrove forests and plantations, stunning landscapes, and peaceful villages before taking on some moderate climbs to truly appreciate the natural splendours. When the terrain becomes hillier, we lowered the distances to make it manageable. Accommodation varies from beachside resorts to guesthouses. Suitability: You can expect a full day of cycling each day. The tour can be enjoyed by anyone with reasonably good physical condition. As is always the case, the fitter you are, the more you will enjoy the riding. However, just in case, an air-conditioned bus travels behind the group for support. Biking Conditions: We ride between 74 and 122 km per day for a total of 1,101 km in 11 cycling days. The roads are all tarmac and in relatively good condition, with occasional challenging ups and thrilling downs, which makes it all the more exciting and adventurous! We meet at the hotel in Krabi for a trip briefing about the epic riding ahead of us! Get a first taste of the fresh local specialties with a seafood dinner. The first 35 km will be on a bicycle lane and back road to avoid the busy traffic of Krabi. We ride together at steady paces through mangroves, rubber trees, and palm plantations. At the 50-km point, we take our first break after our warm-up ride. As we continue south, we have a few rolling hills for the next 10 km before our route flattens out. We end by riding along the Andaman coast directly to our hotel. After breakfast, we start by riding on a scenic road alongside the sea before heading to Koh Sukorn, otherwise known as Pig Island. For those in the mood for hot springs, we can take a slight detour and have time for a dip. Back in the saddle, we'll be cycling through thick mangrove forests and then rubber and palm plantations, taking in the fresh air and peaceful natural surroundings along the way to the ferry. We leave our bikes on the mainland and take a 20-minute boat ride to our island resort. Spend the afternoon relaxing on the beach or take a kayak out to explore the island. Today, we'll cross back to the mainland and stick to back roads to see rural Thailand at its best as we cycle past colourful mosques and remote villages. We'll see some interesting landscapes, lots of friendly smiles, and plenty of unspoiled nature. Once we reach Satun, depending on the time, we can explore the monkey mountain or the night market in this border city before we return to our hotel. This morning starts with 40-km ride to the border. Once we have cycled our first 6 km in Malaysia, we hit our only hill of the day, but the ride up will be tough and is sure to get your heart rate up! After a moderately challenging uphill ride, we of course have a great downhill to follow before enjoying flat and smooth riding all the way to our hotel in Alor Setar, home to the Central State Administration Centre and the birthplace of two of Malaysia's prime ministers. Today is another flat and scenic ride as we hug the coast. There will be a few rolling hills when we skirt Hutan Lipur Rekreasi Tupah, or Tupah Recreational Forest, a protected area in Kuala Muda District, which also provides some welcome shade, and those in need of a cool-down can go for a re-freshing dip in the river. The highlight of our day will be crossing to the is-land of Penang where we overnight at the colonial town of Georgetown, famed for its eclectic mix of colonial-style architecture. Tonight, we hit the town to discover some of town's famous delicacies and learn the tasty truth behind Georgetown's nickname -- Malaysia's food capital. Time off the saddle, you are free to discover Georgetown, Penang’s cultural centre and a UNESCO World Heritage Site. Explore the streets, the heritage buildings and find the many treasures of whimsical paintings and sculptures as well as interactive murals inspired by daily life. Discover the array of colourful mosques in Chinatown and take a stroll through rustic Chinese shophouses, visit Chinese temples, and shop for spices in Little India. Or, you might be drawn to the town's many Western-style skyscrapers and massive shopping complexes set amidst British Raj–era architecture. Be sure to take advantage of Georgetown's world-renown as a food capital! We leave Penang with a transfer before taking the old Hwy 1 all the way to Taiping, a town famed for its tin mines and for being the wettest town in Malaysia. We enter the town by riding under century-old rain trees in the Taiping Lake Gardens. Explore an interesting mix of cultures as we take our lunch here. After our meal, it is a short but steep uphill as we cycle on the edge of Gunung Bubu. Mountains will frame most of our ride this afternoon, but our path will be on rolling hills with lots of vegetation lining the road. Our destination is Ipoh, where you can discover elegant colonial-style buildings from the time when Ipoh was one of the wealthiest cities in in Southeast Asia. We overnight at a small, whimsical boutique hotel where you will be able to discover a fun mix of Malaysia’s Colonial past and modern urban décor, replicating much of the pre-war shop houses found in the Straits Settlements, but with some urban elements and a wicked twist. We stay inland today and have a nice and easy start as we cycle to Gua Tempurung, one of the longest caves in Peninsula Malaysia. Though the tunnel of the cave runs about 2 km, those who want to can see a short section to take in the unique gallery of stalagmites, stalactites and other amazing rock formations found only in this part of the world. Adjusting our eyes back to the light, we ride on and tackle the only significant hill of the day. The jungle-clad road will keep your mind off the ascent. The remainder of the ride undulates through plantations, fields, and villages. We overnight at a hot spring hotel, providing a perfect post-ride muscle relaxer. We will aim to get the distance done in the morning so that we can spend the evening in Kuala Lumpur. Riding through palm plantations there will be undulations throughout our ride as we cycle on quiet roads. Traffic will pick up just outside our lunch destination of Tanjong Malim. Our bikes are loaded while we eat and then it is only a 1.5 hour transfer into the heart of KL Take some time to freshen up in your room before meeting your guide for a sunset walk around the Patronas Towers. Those who wish to go to the observation deck can book their ticket (at own expense) to go up the next day. Spend this free day relaxing or exploring the metropolis of Kuala Lumpur on your own. Or, we can arrange an optional half-day walking tour for you. We head back to the coast today to continue our cycling down the Malay Peninsula. We start from the popular beach resort of Port Dickson, and we’ll flirt with the sea all day before arriving at Malacca. A historical city and a UNESCO World Heritage Site, Malacca boasts numerous historic ruins and buildings, some dating back to 1440 when the state was first founded. We explore parts of Malacca’s history, such as the A’Famosa Fort. Constructed using slave labour, this defensive stronghold protected the Portuguese against foreign invasion and housed the entire Portuguese administration during their tenure in Malacca. The fort remains one of the oldest surviving European architectural sites in Asia and is located just downhill from St. Paul’s Church, the oldest functioning Roman Catholic Church in Malaysia. Visit the Red Square and the fascinating Stadthuys Museum, which is perhaps the oldest-surviving Dutch building in the East, or take a stroll down Jonker Street in Chinatown for a one-of-a-kind shopping experience where you will be able to find anything and everything from clothes, kitschy knick-knacks, antiques and artworks. After leaving the historic town, we are back to the flats as we ride southeast with some nice stretches of palm trees. We finally arrive at our destination of Batu Pahat, a charming town with a famous roundabout protecting a 100-year-old tree. Head over to the seaside village of Minyak Beku where you will be able to enjoy the sea breeze, take a stroll down to the lighthouse, or visit the village's famous well. It’s a big rock about 10 feet in size, believed to have been chiselled by the Siamese back in the 15th century to store fresh water. Perhaps the best way to really experience Batu Pahat is by sampling locally grown tea or coffee at the old-school "warung" (coffee house in Malay) with a side order of toast, half-boiled eggs, or local desserts, or by trying out the delicious treats at the nightly market - a must for any visitor! Every night, you will find an array of stalls strategically set up along a small road selling all sorts from food, clothes, toys, and shoes. The markets take place at a different location every day on a rotating basis, and offer local delicacies such as Pisang goreng; fried banana mixed with a delicious blend of kicap pedas soy sauce, or the Nasi Beriani; a spiced up rice dish served with meat, eggs, fish and vegetables. Batu Pahat, being the cultural melting pot that it is, also offers some delicious Chinese influenced dishes not to be missed, such as the fried oyster omelette, crispy prawn cakes, juicy sambal grilled stingray (for the brave! ), tasty beef noodles, and succulent fried carrot cake. Our final day in Malaysia as we get ready to cross over to the island of Singapore. We ride down the coast to Pontian where we'll stop for lunch. From here we'll transfer to cross the border as it is a very busy checkpoint. Once in Singapore we'll check into our hotel which overlooks the Esplanade and Singapore River. We meet up in the evening for a final farewell dinner. After breakfast you will explore dynamic Singapore, the world's aspiring 'City in a Garden'. Despite its young age and physical limitations, today, Singapore has successfully reinvented itself as a global financial center and, surprisingly, a wonderland for nature fans. The “Little Red Dot,” a term which has come to be used by its proud citizens, has earned its place on the map as one of the world's hottest destinations, boasting hundreds of local attractions ranging from modern museums to whimsical gardens. Your departure flight should be in the afternoon. We can help you arrange a transfer to the airport or to extend your stay in Singapore. We have Trek Domane's and carbon Émonda's available for rent if you choose not to bring your own bicycle. These bicycles have Shimano components. If you have your own saddle that you are comfortable with, you are welcome to bring it, and we'll fit it. You should consider bringing your clip pedals, shoes, and cleats. If you bring your own bike, please make sure it is a road bike in good mechanical order. Citizens of almost 80% of the world countries may travel to Singapore for a period ranging from 30 days to 90 days. Only 39 countries require a visa for Singapore. Please check here if you are from one of the 39 countries needing a visa. Recommended vaccinations are typhoid, polio, tetanus and hepatitis A. A certificate for Yellow Fever is required when arriving from an infected area within six days. Please speak to your doctor for the most up to date information. Meals are included as per the itinerary as B = breakfast, L = lunch, D = dinner. Most meals are local and feature noodles, rice, curries and soups. Southeast Asian cuisine is world famous and we make sure you sample as much local Thai, Malaysian and Singaporean dishes as possible! Any special dietary requirements can also be catered for. Please let us know at the time of booking. We recommend that you tuck away a few extra dollars, perhaps US$20, for incidentals. It is customary to tip local tour guides and drivers, however, the amount you give should be dependent on the level of service you receive. As a general guide we suggest US$3 - 5 per person per day is appropriate. The Thai currency is the baht and although the airport is the best place to exchange money, ATMs are abundant and are the easiest way to get Thai baht. The official currency in Malaysia is the Malaysian ringgit (RM) and in Singapore it is the Singapore Dollar (SGD). Foreign currencies and cards are not generally accepted in smaller towns and villages, but ATMs are widely available.